She ran through that airport completely unaware and certainly unashamed of her extravagant display of emotion. We held each other and cried and laughed and hugged and kissed and didn’t care a whit about what anyone thought. For a moment the rest of the world didn’t exist. This is the beauty of life among believers. This is the power of fellowship. We learn to love God with such abandon and extravagance in the presence of our spiritual family that we grow more capable of expressing it where less understanding eyes will see. It is years later and I have not yet reached that point in my relationship with that once little girl where she is embarrassed to be seen with me. I hope that I never will, but it causes me to ask the question, “Am I ever ashamed to express my love for God?” I read the passage above and wonder if I would have loved Jesus enough to overcome my fears and doubts. I wonder if I am more driven by self-preservation than I am by compassion and devotion. Fortunately my current spiritual family is more than willing to seek an extravagant love for God together. I want to worship God with abandon. I want to weep with tears of deliverance. I want to laugh with heartfelt joy. I want to kneel at the feet of my Father and worship Him as He sees fit. While the thought of this sometimes causes me to fear, I am assured that “perfect love casts out fear.” There are not words to express the comfort and courage that are gained by knowing I am surrounded by others who desire the same experience. We want to love God more than we love our reputations, more than we love our possessions, more than we love anything that this world has to offer. So what is your alabaster jar? What is it that you need to give up in order to love God as He deserves to be loved? Who is it that looks with mocking eyes on your faith? What price are you willing to pay in order to worship without shame? To be honest, I’m still working on answering those questions myself, but I am sure that I want to know the answers. Your lost sheep, Your broken lambs. The rest tent is the white rectangle in the middle of the picture. 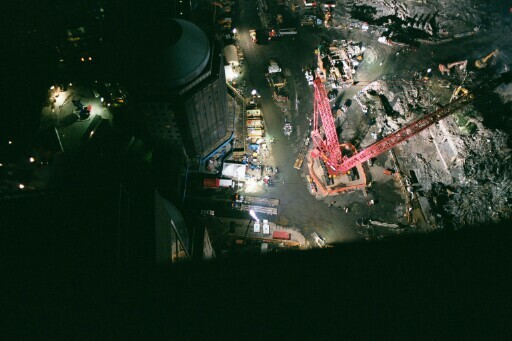 You can view a current picture of the World Trade Center here. Something I post every September 11th. Pray for peace. It was early on Tuesday morning as I got dressed and ready for work. Molly and Keely were still asleep when the phone rang and my Mother’s broken voice came across the line, “Turn on the TV, Christopher!” The image of that first tower smoldering in the New York Skyline is still fresh in my mind, ingrained there with so many other images that came into homes and business throughout that day on screens too small for the enormity of the event. A few weeks later the call came from The Salvation Army Headquarters that they needed officers to volunteer for duty at Ground Zero; I had my name in the same day. There were five of us from California and we arrived in New York October 15th of 2001. We went through the standard briefing, received our assignments and then they took us to Ground Zero. When the subway arrived at the Chambers Street station you could feel the quiet, the normally bustling crowds subdued and solemn. Words fail to describe the scene at the World Trade Center. Photographs may be worth a thousand words, but a thousand words would not be enough to describe what that place of desolation felt or smelled or sounded like on that day. Those with me said little and walked on in silence around the perimeter of Ground Zero. With each stop we would meet the men and women who worked diligently to recover those who had fallen what seemed ages ago. They would smile and welcome us to the work, but the weariness and sorrow in their eyes was deep. Our team worked at Ground Zero for two weeks and much could be written about what we saw and heard in those 14 days, but I will only share one event as the nation remembers September 11th, 2001. I was assigned with a fellow officer to man a rest tent across the street from the World Trade Center and what was now called “The Pile.” We provided drinks, snacks, basic first aid supplies, magazines and other items for the recovery workers, but we also served as chaplains as the need arose. I was by myself one evening (I worked the shift from 11pm to 11am) when a firefighter asked if I was a chaplain. I answered “Yes” and followed him to The Pile. The crews had just uncovered an elevator car and were recovering the remains of seven people; seven sons and daughters taken from their resting place to be identified and laid to rest again with honor and dignity. As they lifted each stretcher from the hole, an American flag was draped across the body and then they placed the stretcher on a motorized cart to transport them to the morgue. I was asked to accompany one of the fallen and took my place at the foot of the stretcher and waited to make the walk. That is when the siren sounded. One long, deep clarion tone and everything stopped. Truckers stopped their dump trucks and shut off the engines. Cranes paused with loads of debris still in their grasp. Dozens of workers stopped where they were and faced the Pile, hats off and held over their hearts. A hush settled on that hallowed ground and we began the long procession to take the seven on their way to loved ones and a better resting place. It was one of the most noble and honorable moments of my life. Over the next few days that moment rested in my heart and mind and changed the way I saw what was around me. Perspective comes at a high price sometimes, but then it can help us value what we ought. Our team headed back to California on October 29th, ready to be with family and to consider all that we had seen the past two weeks. I remember seeing my little girl, Keely, waiting with her mother in the concourse. The sound of, “Daddy! Daddy!” was the sweetest sound I had heard in weeks. She ran toward me and I toward her and we hugged and cried and mommy joined in soon after. It has been 15 years since the towers fell and America rose to the resulting challenges and I have not forgotten that moment. Each day is a day to live the life that hateful men tried to destroy. I will spend this September 11th with my family. I will go and worship God with my brothers and sisters in Christ. I will rest at home with my wife, daughters and extended family. I will celebrate the life I have and give thanks to God. We will play and laugh and eat good food. We will snuggle and watch funny cartoons and read a book or two. There will be days ahead when grief will visit us again, but we will not let it stay for long. If you let it settle in and get comfortable, it is harder to kick out and it does not suffer roommates. This day is about God’s grace turning mourning into dancing. I have played a few different sports over the years, and in that time I have inflated a number of balls. Footballs, basketballs, soccer balls, volleyballs. They all have the same thing in common – they should not be over inflated. Several things can happen and all of them are bad. Over inflation can stretch the ball out of round, cause leaks and weaken the seams, all of which make the balls useless for their respective sports. Imagine what overinflating can do to an ego. God has designed us to work the right way. Just like a soccer ball is designed to cut through the air when it is kicked or thrown, we are designed to work a certain way. If we are over inflated, we won’t fly right. We will be off balance, wobbly and inaccurate. We can also be under inflated. We can fall flat and unresponsive. On the one hand we can have a view of ourselves that ignores our limitations. We see ourselves as better than we are and even worse, better than others. On the other hand, we can have a diminished view of what God has created us to be. We are blind to the abundant life He can produce in our lives. Somewhere there is humility that refuses pride but engages the fullness of life in Christ. It is easy to get over or under inflated. In our culture of narcissism, over inflation seems to be the norm. We are even taught to talk ourselves up and say positive things about who we are, whether they are true or not. Plenty of the popular talk shows are based on the “You are Special” appeal to their audiences. They sell them on ideologies that don’t demand true change of character, only a change of perspective. You are a princess because you believe you are. Nonsense. There is a great gap between your belief defining the truth and the truth defining your belief. It is just as easy to become under inflated. Pride breaks people, whether it is the proud one or the ones who got in their way. That brokenness can begin paterns of thinking that deny the image of God in His creation. It is this brokenness that allows people to go into self-destructive behavior, wrecking themselves and their relationships. Under inflated people get stuck, living flat and empty lives. This is not the abundant life God calls us to. There is a level of inflation that puts in the right place with God and man. We are not full of ourselves, but what He has put in us. We understand this, so we have no desire to fill up on anything other than what He supplies. This gives us the ability to fly right and suffer the blows from the world without being punctured or falling flat. When God is at the heart of what we believe about ourselves we can understand our brokenness and the hope for wholeness with confidence, not arrogance or self-pity. I pray that God helps me see when I am trying to over inflate. I hope that my friends and family will, in love and gentleness, point out when I am being full of myself instead of the God who loves me. I pray that God will guard me from losing air, limiting my expectation by my brokenness instead of His power to heal and renew. Lord help us be filled with you and nothing else. Amen. Not too long ago, I came home from work to an unhappy wife and a very quiet older daughter. Missing was the younger daughter, who had locked herself in the bathroom. I was asked to step in and see if I could extricate the youngling and began working on the lock, little whimpers punctuating my fiddling and tinkering. The extrication became a little more involved once the door was open. Big trouble for a little girl. It was evident that my beautiful little girl had ventured into the world of cosmetology and home décor. Unfortunately she had done both with the same medium – my wife’s lipstick. While I could appreciate the artistic flair evident in the strokes of red on the wall, door and daughter, I was pretty sure my wife would not be a fan of the arts that day. The room and child needed to come out of this experience unblemished. My little girl didn’t need to be told that what she had done was wrong. Her tearful demeanor and cowering in the corner were clear indicators that she was afraid of punishment. We will never know if she was not able to unlock the door, or was too afraid to face mommy and daddy and so refused to unlock the door. She needed to know that we still loved her, that we were okay. It is very easy for us to lock ourselves away from God and fear what He will think of us if we open up the door. Our sin or disobedience can seem so great that we would rather try to hide it away and hope that He will ignore us. But God is a seeker…He is a good shepherd who finds His sheep wherever they may try to lose themselves. He is the healer and redeemer, cleansing us of our blemishes so we can stand before Him unashamed. All it took to clean up that lipstick was soap, time and effort. For our sin it took the perfect Son of God, coming in the fullness of time and taking our place on the cross of shame and punishment. I cannot think of anything my daughter could do that would cause me to stop loving her or trying to provide all she needs for this life and the life to come. In a far better way, God loves us and will not relent in calling us to safe pastures. He will call us out from behind our locked doors. He binds up our injuries, self-inflicted or otherwise, and He watches over us with compassion and grace. The evidence of the lipstick incident is gone. 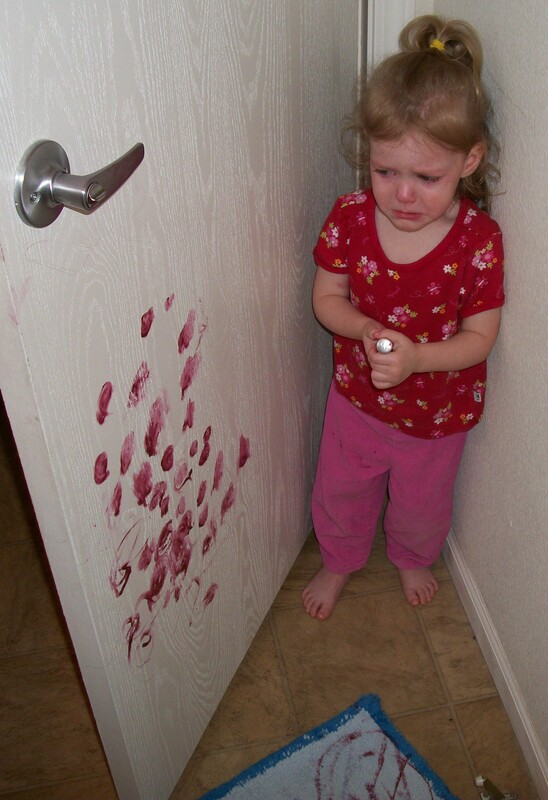 There are no red stains left behind on door, wall or daughter. They are unblemished in that regard, but sadly my daughter can still get herself into trouble. She stops listening to those who would guide her in good directions, and finds herself in trouble again. It is a beautiful thing to see a lost lamb returned to safe pastures; it is tragic to see that lamb lose her way again and head into harm’s way, but that is the life of parenthood. Our heavenly Father is no less longsuffering than the best of us. He watches us as we wander our own way, putting our souls in harm’s way. Patiently He waits for us to unlock our doors that we try to hide behind. Gently His voice keeps calling to me with the promise of forgiveness and restoration. With strength beyond anything we can imagine or understand, He carries us from the “the valley of the shadow of death” to lush pastures and quiet waters. Do you have any locked doors? Are there any blemishes on your soul that no one else knows about? Do you worry about the stains of your past being too deep for the Shepherd to cleanse? I pray that the love of God, the Good Shepherd, would overcome our fears; that we would heed his voice and enter His rest. I pray that we would learn the beauty and power of being His sheep. I know – not a very cheery passage to open with, but give me a chance. It is clear from this warning from Jesus to the Pharisees, and many others like it, that He was not pleased with how they were representing Him and His Father in heaven. They had pillaged worshippers of God in the temple courts, they had so convoluted the interpretation of the laws that they spent more time arguing about them than helping God’s children and they had lost sight of their own brokenness. The Pharisees are the repeated example of where a religious, legalistic life will take a person. All glitter; no gold. Whitewashed tombs. There are plenty of us out there right now heading down the same path the Pharisees trod and Jesus is warning us. Each time we bristle at someone questioning our holiness, every time we deny any need on our part, every time we hold out our good deeds for others to see and admire we build the walls thicker and paint them whiter. When the world has wounded us, but we don’t want anyone to see us as weak; when our hearts are broken and we put the mask of contentment on to hide the pain; when we clothe ourselves with rationalizations to cover the sin in our lives – we are getting darker and closer to death on the inside. There is another incident earlier in Matthew that gives us incite to how we can avoid this condition: Jesus said, “Let the little children come to me, and do not hinder them, for the kingdom of heaven belongs to such as these.” When he had placed his hands on them, he went on from there. (Matthew 19:14-15 [NIV]) I don’t know about you, but I have to be careful what I am teaching my children about what it means to be a good Christian. When I tell them to be strong or tough, am I teaching them to be like the Pharisees? When I am telling them to be “appropriate,” am I teaching them to love God within a box? Am I showing the same level of excitement and pride for their Spiritual successes as I am for those gained by physical prowess or innate skills? I think the problem is that we spend too much time teaching children to act like “grown ups” and not enough time teaching them how to be wise. In the end we have to remember that in God’s eyes we will always be children. This is important if we want to experience healing in our lives because Children very seldom hesitate to let someone know that they are hurting. While they may not always like the cure, most children will still run to mom or dad with a skinned knee or hurt feelings. Maybe that is where my children need to learn about being strong – the part where they get cured. Maybe I need to be more like my daughters in my life with God. Maybe I need to learn to cry when I get hurt. Maybe I need to be brave when my Father tells me to hold still while He does His healing work. Maybe I need to be more like a child. Let the healing begin.